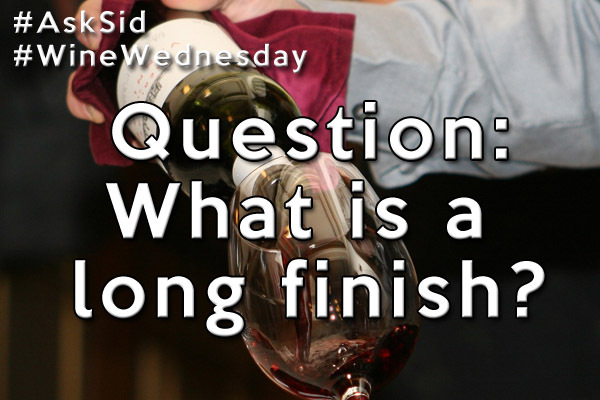 Ask Sid: What is a long finish? Question: What is a “long finish”? Answer: Easy. A long finish is just what it says – lingering flavours of food or especially wine that you can still savour for some time after tasting. That distinct aftertaste stays with you. I know people who like eating garlic and tuna but don’t like the strong or fishy lingering aftertaste of those foods. For wine this is usually an admirable thing because it indicates that there is some special intensity and depth there. A long finish is a particularly important factor in assessing the potential for aging of a young fine wine before all the elements are matured together. Generally this is a good characteristic to appreciate and admire but can also be overrated sometimes. For example if you are wanting a light elegant refreshing wine the overall balance will be a more important factor than a long finish. However, for quality more expensive wines from lower yields a long finish is something you are paying extra dollars for so be sure to take the time to enjoy it. Do you prefer a wine with a long finish?